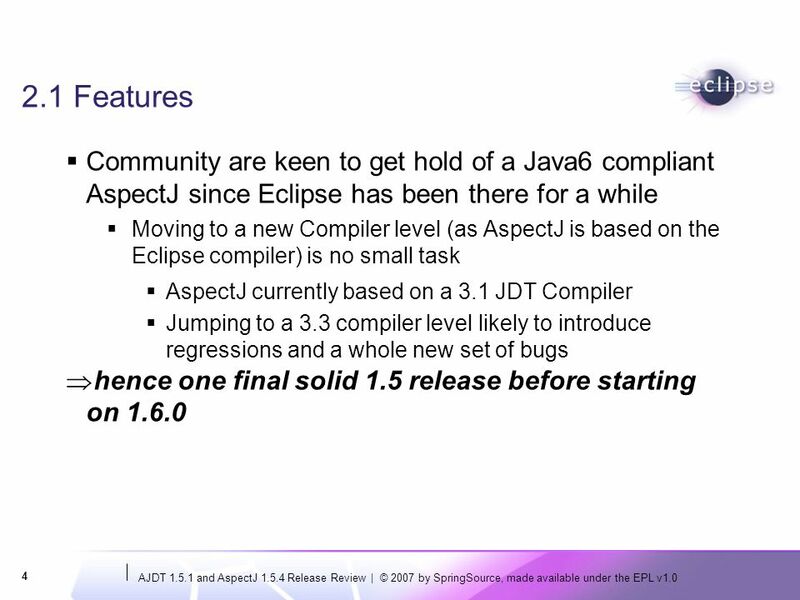 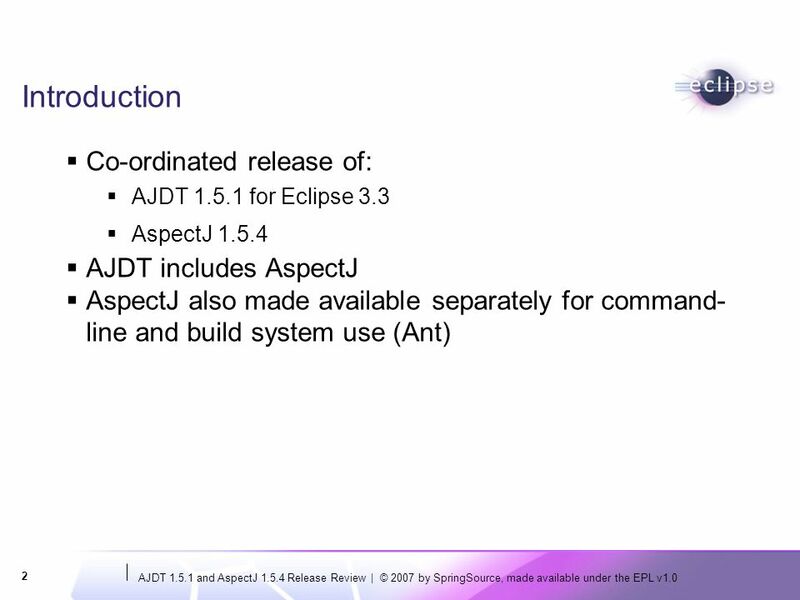 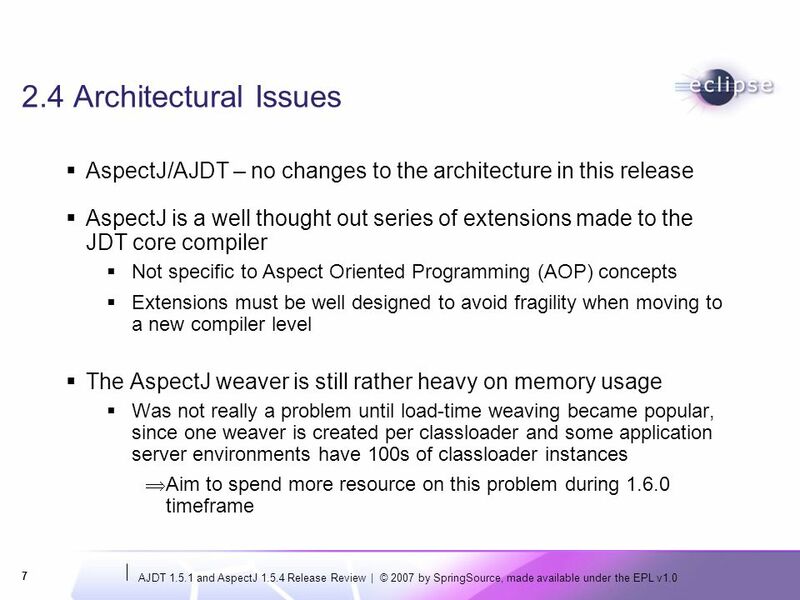 AJDT 1.5.1 and AspectJ 1.5.4 Release Review | © 2007 by SpringSource, made available under the EPL v1.0 1 Release Review: AJDT 1.5.1 and AspectJ 1.5.4. 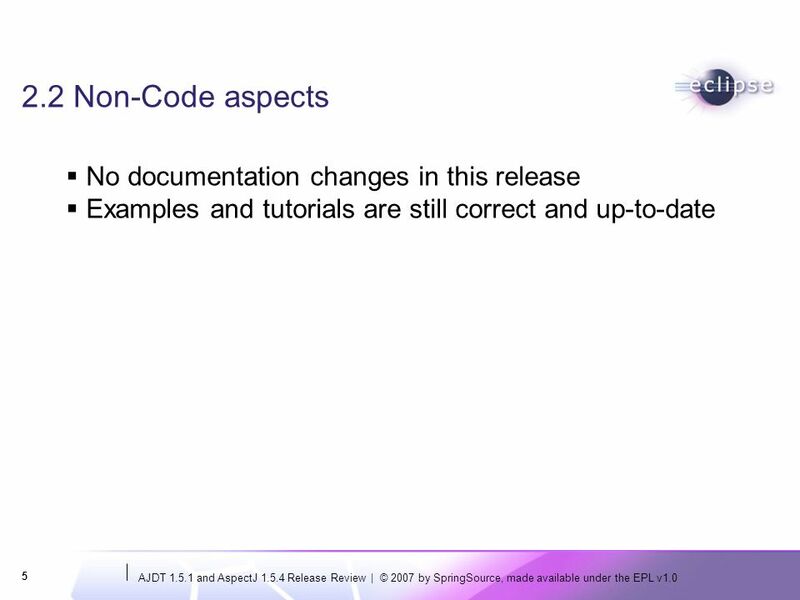 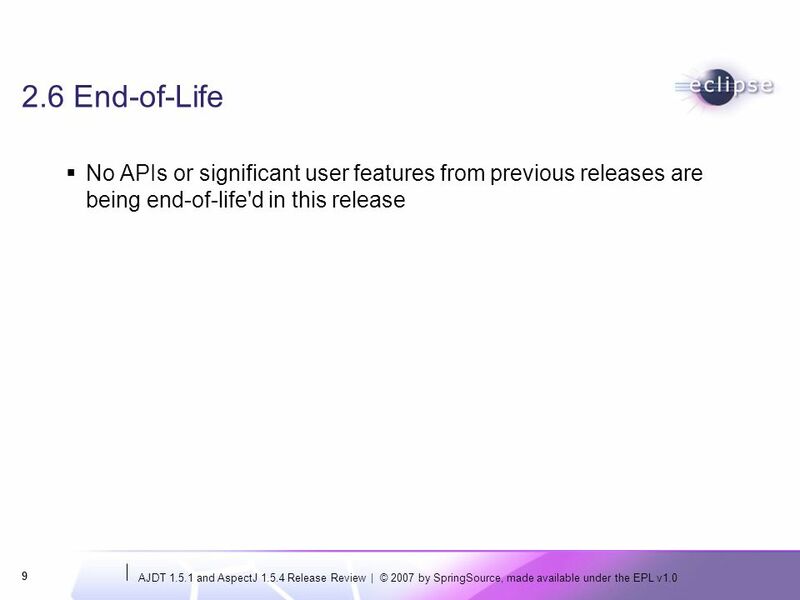 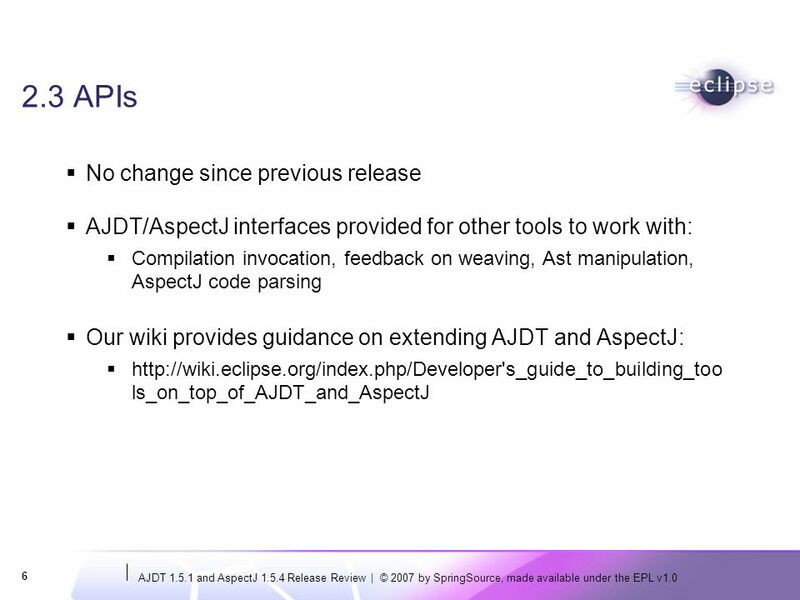 Download ppt "AJDT 1.5.1 and AspectJ 1.5.4 Release Review | © 2007 by SpringSource, made available under the EPL v1.0 1 Release Review: AJDT 1.5.1 and AspectJ 1.5.4." 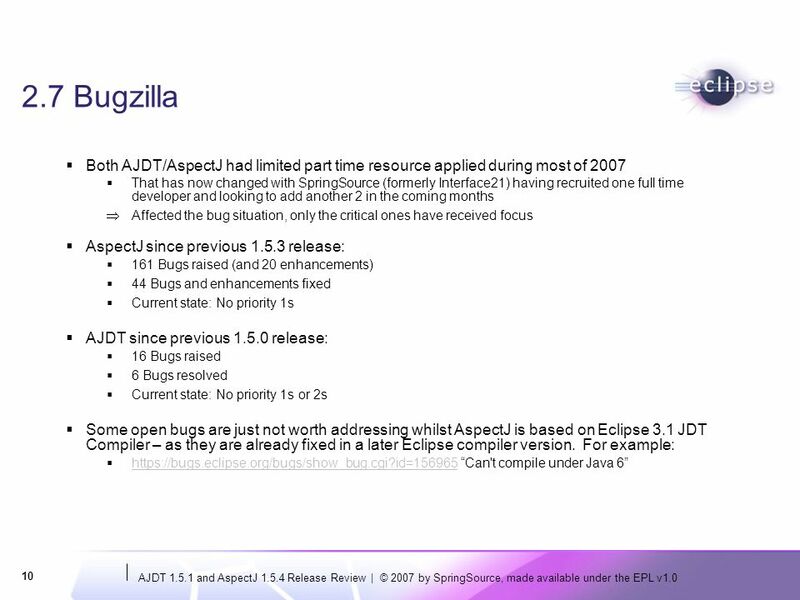 Spring Roo and the Cloud Shekhar Gulati. 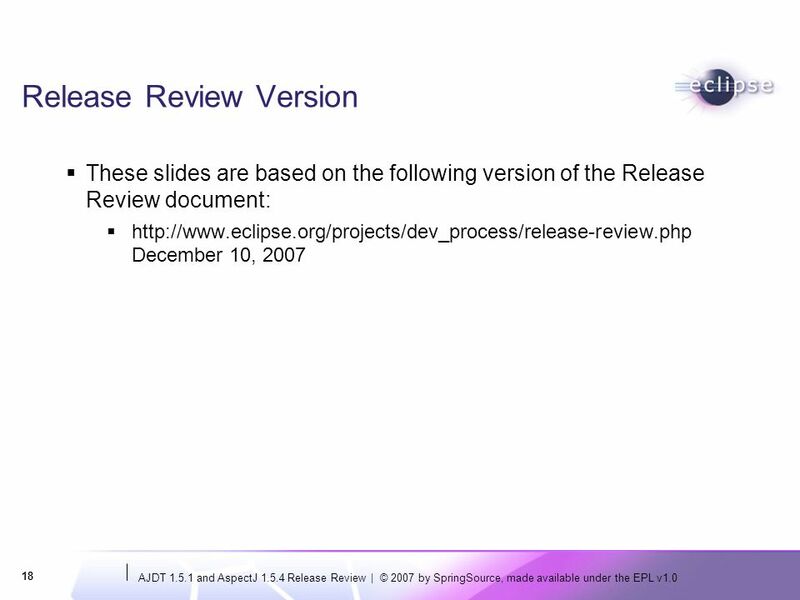 Tom Sugden EPCC OGSA-DAI Future Directions OGSA-DAI User's Forum GridWorld 2006, Washington DC 14 September 2006. 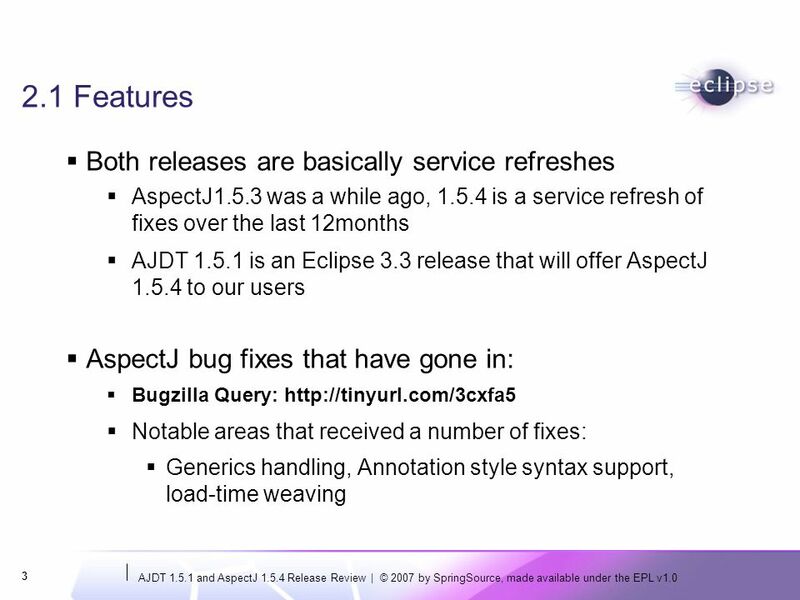 ERCP 1.0 Release Review | © 2006 by Gorkem Ercan, made available under the EPL v1.0 1 Embedded Rich Client Platform (eRCP) 1.0 Release Review September. 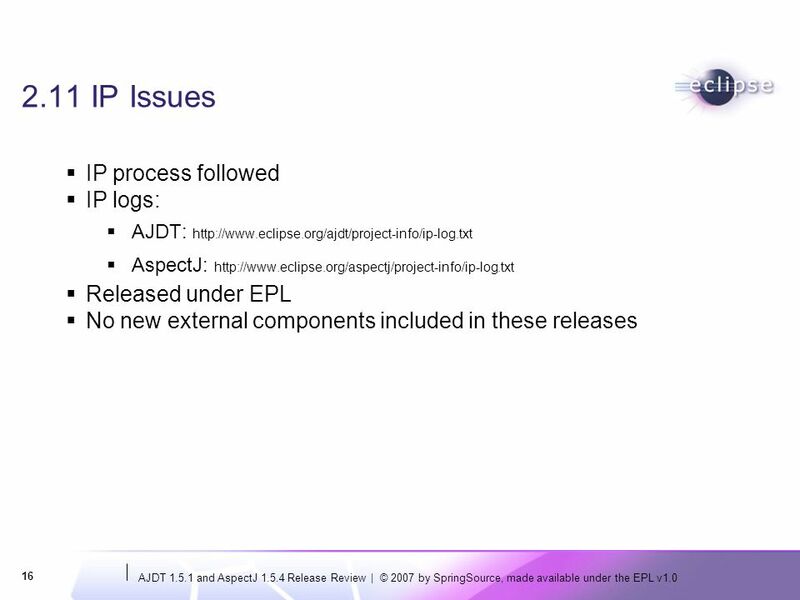 Helios Simultaneous Release | © 2010 by IBM Corporation, made available under the EPL v1.0 1 Equinox Project 3.6 Release Review Equinox Project Leadership. 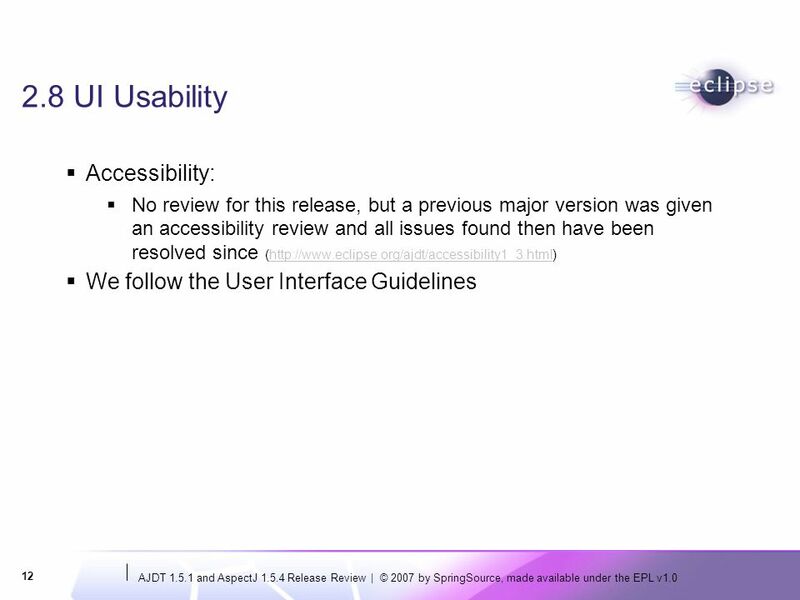 Galileo Simultaneous Release Review © 2009 by Borland Software Corp., made available under the EPL v1.0 Object Constraint Language (MDT OCL) 1.3 Galileo. 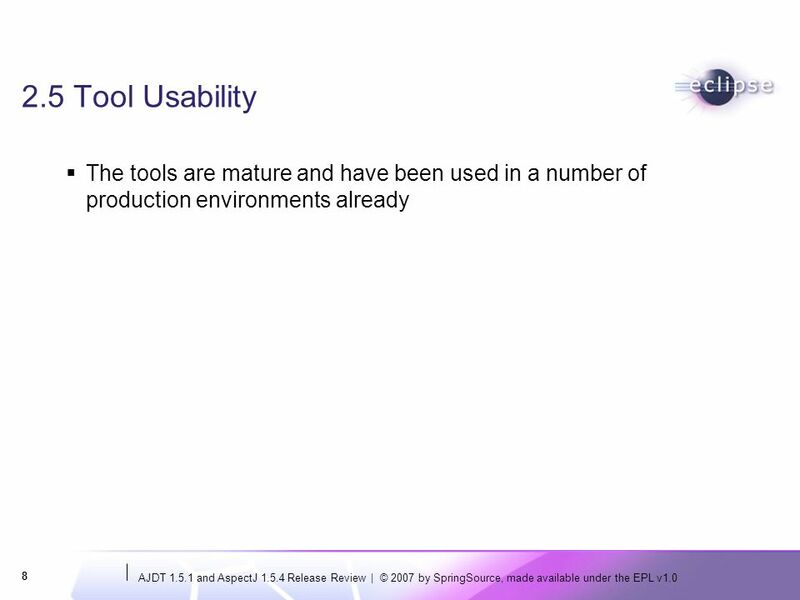 Ganymede Simultaneous Release Review © 2008 by Borland Software Corp., made available under the EPL v1.0 MDT UML2Tools 0.8 Ganymede Simultaneous Release. 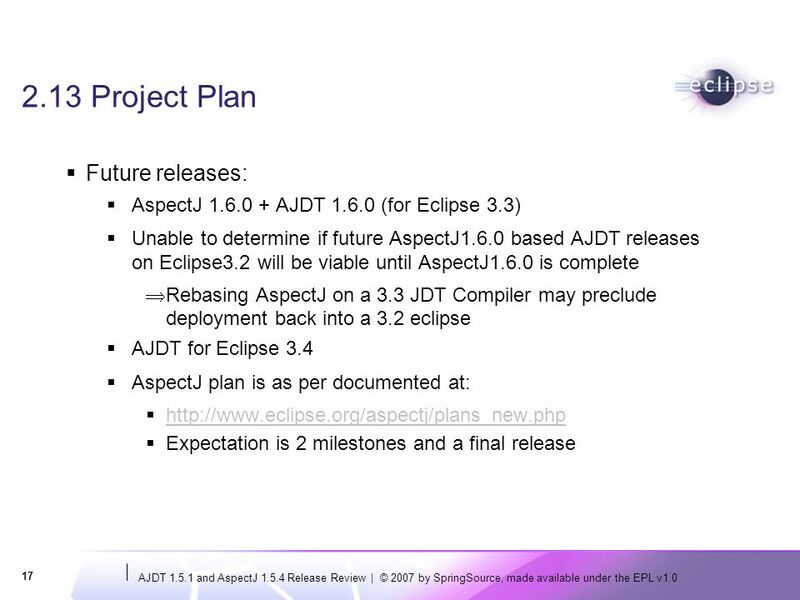 © 2007 by Neil Hauge; made available under the EPL v1.0 | Neil Hauge Project Lead Oracle Dali JPA Tools Project – Graduation Review Draft. 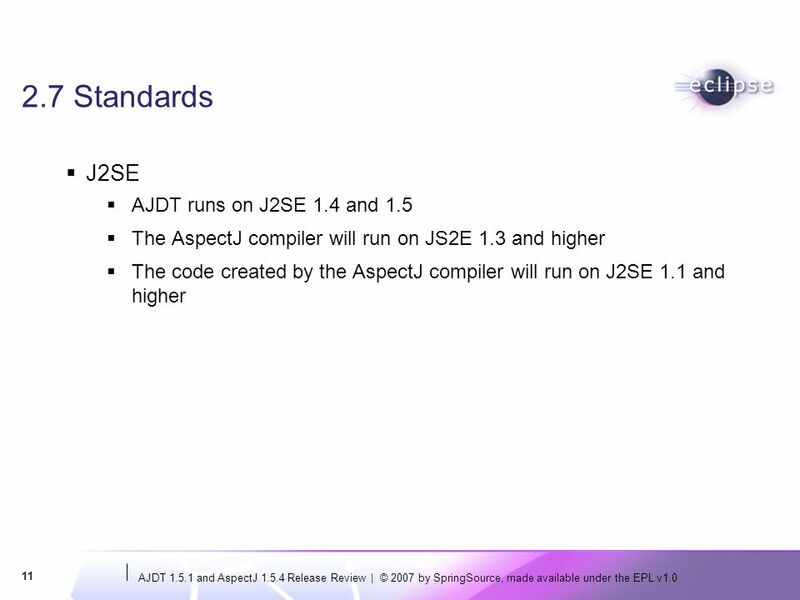 Describing Complex Products as Configurations using APL Arrays. 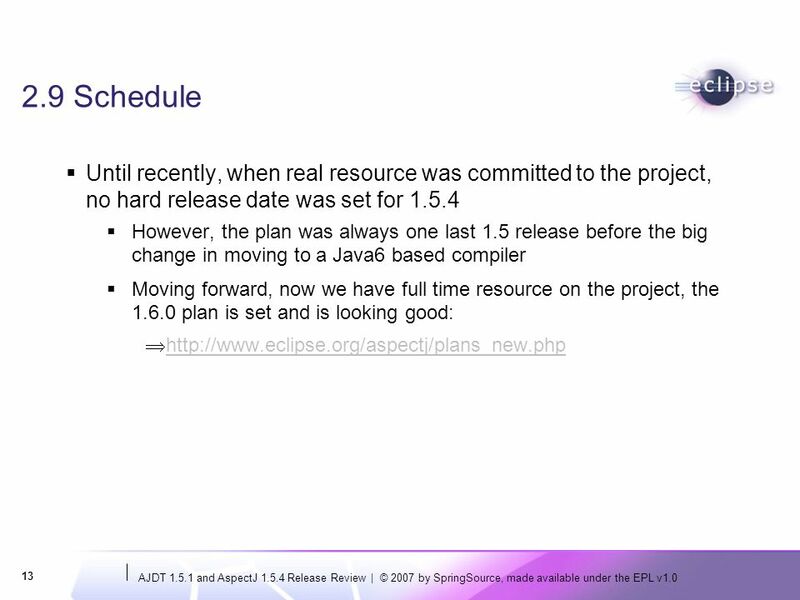 Review for Eclipse Release Review | © 2012 by Review for Eclipse Committers, made available under the EPL v1.0 1 Review for Eclipse (R4E) 0.11 Release.